British-born Dr Martin Brook completed his PhD at Dundee University in 2001, having conducted fieldwork in New Zealand’s Southern Alps, northwest Iceland, and the Scottish Highlands. As well as his work on the Tasman glacier, Brook is working on an understanding of the dynamics of the Fox Glacier and of the rates of landscape evolution in the North Island, particularly in the Tararua ranges. One of our iconic landscapes is changing rapidly, writes Dr Martin Brook. And there is nothing much we can do about it. seen by Landsat in 2001.
where the lake is likely to eventually terminate. the sub-bottom materials beneath the lake floor. 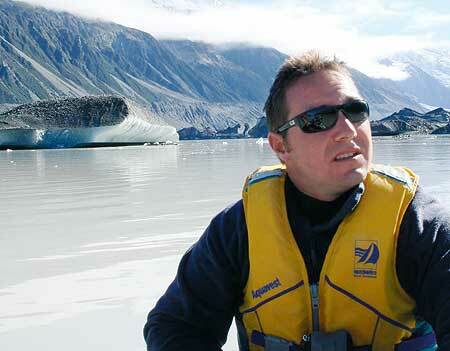 For somewhere to contemplate climate change and its consequences, I can recommend nowhere better than floating on an inflatable boat on the ever-extending lake that now lies at the terminal face of the Tasman glacier. Thirty years ago there was no lake: the Tasman river issued forth from the glacier’s face. By the early 1980s there were a few surface ponds – the technical term is ‘supraglacial’– toward the end of the glacier. By the late 1980s, when Martin Kirkbride, (who would supervise my PhD in the late 1990s), undertook his first survey of what was happening, the ponds had begun to coalesce, and by 1990, the Tasman Glacier’s had its own ‘proglacial’ lake. When I first visited the Tasman Glacier in January 2000, as part my PhD fieldwork, the lake was two-to-three kilometres long, and today the lake is an inescapably significant geographic feature: six-to-seven kilometres long, a couple of kilometres wide and – as we discovered in a detailed survey in April 2008 – at least 245 metres deep. No, this is not man-made global warming at work, but something much older. The Tasman Glacier is belatedly responding to the post-1850 century of climate warming that began with close of the ‘Little Ice Age’, a 400-year event which included three cool periods. That climate warming may not have amounted to much – perhaps a 1 degree Celsius rise in average temperature – but it was enough. Worldwide, as numerous studies have shown, glaciers in general went into retreat. In general, but not universally. For when you look at an individual glacier, matters become more complicated. The mass balance (or ‘health’) of a glacier is a delicate budgetary exercise. There are inputs, (collectively known as accumulation) in the form of snowfall and avalanching onto the surface. And there are outputs (collectively known as ablation), including surface melting, meltwater runoff and evaporation, and the direct evaporation of ice. New Zealand’s mid-latitude situation and its particular geography mean that the effect of climate change – either current or historic – can lead to quite different glacial responses according to the glacier you choose. Indeed, because the prevailing weather patterns have led to higher snowfalls in upper basins or nevés, the Fox and Franz Josef glaciers have advanced over a kilometre from their 1950s and 1960s positions, even as glaciers on the east coast of the divide have continued to retreat. The Fox and Franz are ‘clean ice’ glaciers: they lack the insulating rock, gravel and dirt cover you see on glaciers such as the Tasman. Because of this, they respond quickly to changing climatic conditions. A recent study published by our group1 found evidence that the terminus of the very steep Fox Glacier responds to changes in accumulation of snow in its nevé in less than a decade. In contrast, low-angle debris-covered glaciers like the Tasman Glacier respond an order of magnitude more slowly to climate change, and when it is climate warming the change often takes the form of a gradual surface lowering. Until the arrival of the lake, this is exactly what happened to the Tasman, the downwasting evident to anyone who, over the years, had to climb ever further down steep moraine walls to reach the glacier surface. With the formation of the lake, the equation changed. The downwasting continues, but it is the lake that is exerting the greater influence: every day and all day, its waters eat away at the glacier. The lake allows the terminus of the glacier to calve blocks of ice off the snout. This happens in a number of ways. At the water line, a thermo-erosional notch forms, melting a large, flat cavern into the ice cliff. This destabilises the ice above, causing subaerial calving; sometimes there are spectacular collapses of ice into the water, sending waves across the lake – to the consternation of anyone in a small survey boat! Another type of calving happens beneath the water’s surface, chunks of ice breaking away from the submerged portion of the glacier and rising to the surface as icebergs. During our April fieldwork, icebergs would occasionally emerge from the water at quite large distances from glacial terminus. The distance of the icebergs from the terminus taken together with the evidence of our sonar work suggests that a large ‘foot’ of ice extends for maybe 200 metres under the water away from the ice cliff into the proglacial lake. The work that has been done on similar calving glaciers in South America and Alaska suggests that there is a direct relationship between the calving rate of the ice cliff and the water depth. As lake depth at the snout increases, more glacier ice comes into contact with the lake water, more melting occurs, and the calving rate increases. The Tasman Glacier – and the lake at its tip – occupy a deep rock basin carved during the last major Ice Age around 20,000 years ago. As the Tasman Glacier retreats further up the Tasman valley, the rock basin is deeper and so the lake becomes deeper too, in turn putting more and more of the front of the glacier in contact with lake water. And whereas many glacial lakes are dammed by narrow moraine walls, which may eventually breach, the dam wall of the Tasman’s glacial lake lies below the level of glacial outwash plains that stretch tens of kilometres to the south towards Lake Pukaki and the Mackenzie basin. 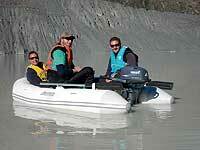 So what is going to happen to the Tasman Glacier and the lake with which it is now twinned? Or, more particularly: How far will the glacier recede? How large will the lake grow? And how quickly are things going to happen? In the 1990s, when the lake was starting to grow significantly, Dr Martin Kirkbride put forward two scenarios, one moderate, one more extreme. In his moderate scenario, the glacier would retreat up the valley and the lake, growing at a moderate rate, would reach seven kilometres long by the year 2200. In the more extreme scenario the glacier would retreat rapidly reaching 10 kilometres up-valley by 2008 from status quo in 1986. With the lake now at seven kilometres and growing, this is much closer to the reality. To date, it looks like the ice cliff has retreated at the rate of roughly 180 metres a year, but the rate is likely to increase as the lake deepens. 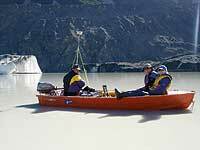 The relationship between the lake and the speed of glacial retreat is fascinating. Within the glaciological community there is intense debate about the relationship between calving and glacier dynamics. A central issue is whether calving losses are the cause of ice flow acceleration or the consequence (2). One view is that calving is the ‘master’, process, with calving losses triggering a cascade of dynamic changes up-glacier, including flow acceleration. A contrasting view portrays calving as the ‘slave’ of glacier dynamics, responding more or less passively to changes in other parts of the system. In this view, coupled dynamical and geometric changes to the glacier system drive increased calving rates, by causing the calving front to retreat and increasing the rate at which ice is delivered to that point. Conceivably the glacier will continue to retreat rapidly until bedrock in the valley profile is exposed at water level (730 metres above sea level) between the glacier and the lake. Geophysical work carried out in the early 1970s in the valley suggests that this point will be reached after another eight or nine kilometres of recession, where the Hochstetter Glacier now joins the Tasman. This will be vastly different landscape from that which we know today. Are there then wider lessons to be drawn from all of this? I do not know. Certainly, as I have said, the Tasman Glacier is reacting to climatic changes that occurred well before any concerns about global warming. Perhaps what it illustrates is that small climatic changes can have complex and sometimes disproportionate effects. 1. Purdie et al. (2008). Seasonal variation in ablation and surface velocity on a temperate maritime glacier: Fox Glacier, New Zealand. Arctic, Antarctic & Alpine Research 40: 140-147. 2. Benn et al. 2007. 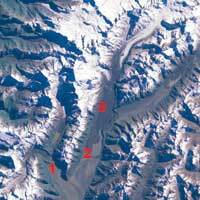 Calving processes and the dynamics of calving glaciers. Earth Science Reviews 82(3-4): 143-179.